A few months ago when I went to see Toronto’s beloved super cover band, Dwayne Gretzky during their residency at the Horseshoe Tavern, I discussed the importance of hooks in a song with my friend, Ian McDonnell over a few pints. I strongly agreed with him that regardless of the technicality of musical composition, if there is a snaring verse to grab the listeners' attention, the song flourishes its sound to the fullest without a ninja like guitar trick. 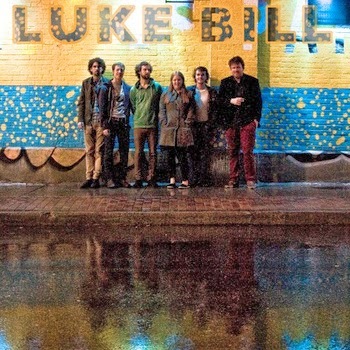 McDonnell is a singer/guitarist for a Toronto based alt-country/pop rock outlet, Luke Bill. The band newest self-titled EP, epitomizes this theory. The initial tune from the EP, Wonders, kicks off with raw guitar strolls and resonant vocals, which dance cohesively with the guitar jam. It keeps the sounds simplicity, which highlights the expansion of its musical hook. The soft touch of McDonnall and Becky Johnson's vocal waltz has an opportunity to be deployed in the following tune, One Trick Machine Gun, which is my favorite song from the EP. The harmony is complemented by adulcet melody line which gives me a nostalgic feel of good oldies from the 60's. It's very simple and easy, but cultivating at the same time. The last tune, Every Time You Love, You Die, builds its momentum through guitar jam and lamenting vocals and brings the climax of orchestratic harmonies, which I picture a sing- along session with the audience at their show. I just missed their EP release party at Cameron House on March 22nd. However, I'm sure they will play another show in town shortly. Meanwhile enjoy their new EP from here!